Finland is the birthplace of a wonderful tool. The Mehu-Liisa extracts juice from fruit using steam and is a great time-saver for any serious gardener who likes to work in the kitchen with their harvest. My apples are 'organic by default' and that means they're not perfect. I usually make applesauce with them, which comes in handy for winter recipes, but this year, I decided to do something a bit different. My friend owns a Mehu-Liisa juice extractor and I thought it would be nice to give it a try with my apples. The stainless steel unit is designed so that the boiling water in the lower section opens up the cells in the produce and releases the pure juice. It is then drained from the center section via a tube. The produce remains in the top section, and never touches the water. The result is a beautiful, clear juice that can be used in a number of ways. The first step was to gather and wash my apples. My tree is an old heirloom Gravenstein and the apples have a wonderful sweet/tart quality that cooks up beautifully. I filled my sink full and started cutting them into the top section of the Mehu-Liisa. It isn't necessary to peel the fruit; I just cut away any insect damage and tossed the chunks into the basket. The unit is designed so that steam rises from the bottom section through a specially vented tube through the sieve-like basket. When the juice is released, it drips into the middle catch basin. There's a special tube attached to this section that allows the cook to draw the juice off as the container fills. I filled the bottom section with water and adjusted the heat so that it was gently boiling. Instructions recommend checking the water level every 30 minutes or so to make sure that it doesn't boil dry. Mine never did, even though I kept it boiling for about 90 minutes. Juice started to flow after about 15 minutes and I placed a container on a chair beside the stove to catch it. Once my container was about full, I took everything off the heat and processed the remaining fruit through my food mill. The result was a creamy and pure applesauce with a great flavor. The Mehu-Liisa gave me two for the price of one. A lovely juice that we'll make into jelly and the applesauce that I froze in 1 cup measures. This makes it really easy when preparing a recipe. Cassidy and her friend Brittany wanted to learn to make jelly, so we used the juice to make a delightful home-made treat. We read the recipe instructions on the purchased pectin and measured out the exact amount of juice needed. It looks like we'll be able to make several batches of jelly from our juice. Jelly making is an exact process and you need to make sure your measurements are accurate. It is also a problem if you try to double the recipe. It is recommended that you only make one batch at a time for successful results. Once the juice is poured in an over-sized stockpot. (you need lots of extra room, trust us) add the pectin and as the juice heats, stir to dissolve. When the juice and pectin comes to a full, rolling boil, add the correct amount of sugar and stir. The mixture will return to a full, rolling boil and expand in the stockpot, if you use one that is too small, it will boil over, so be prepared with a large pot. When it comes back to the full, rolling boil, time it for one minute and then take it off the heat. Your jelly is done. 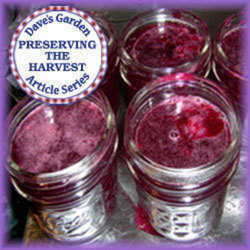 The girls poured the jelly up into clean, hot canning jars and added lids and bands. We processed the jelly in a hot water bath for 5 minutes and as we were taking the jars out of the water bath we could hear them start to seal. 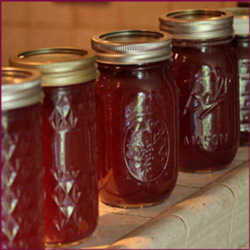 Many people do not process jelly, but most canning and freezing literature recommends it. The processing forces the remaining air out of the container and heats the contents to a uniform temperature that kills bacteria. If you make just a little jelly (this recipe made 32 oz of jelly) you can just keep it in the refrigerator. Chances are, your family will gobble it up anyway. 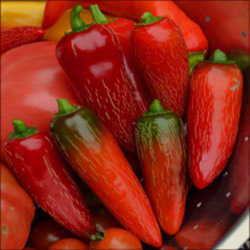 But, if you want to give it as gifts or store it for any period of time, you do need to process it in a water bath. I just used a big stockpot with a tea towel in the bottom. I covered the jars with hot water and brought it to a boil with the lid on. I kept it at a boil for 5 minutes and then we removed the jars from the water. My spotty apples were transformed into tasty treats in the course of an afternoon and I learned to use a new kitchen tool. There are a number of steam juice extractors on the market and if you have a significant amount of produce that needs juicing, it could be a wise investment. I also understand that you can use a steamer like this to steam-blanch vegetables before freezing and also to steam healthy meals. I had fun with my borrowed Mehu-Liisa and am contemplating adding one to my arsenal of kitchen tools. It sure makes short work of a process that could be messy and time consuming.